Five years later Ivan relived the experience and annotated the samples in a 1999 issue of Roctober. Mike Lynch had a copy of that magazine and posted the thirteen pages. Then, in 2014, Ivan wrote about the experience again for Boing Boing. 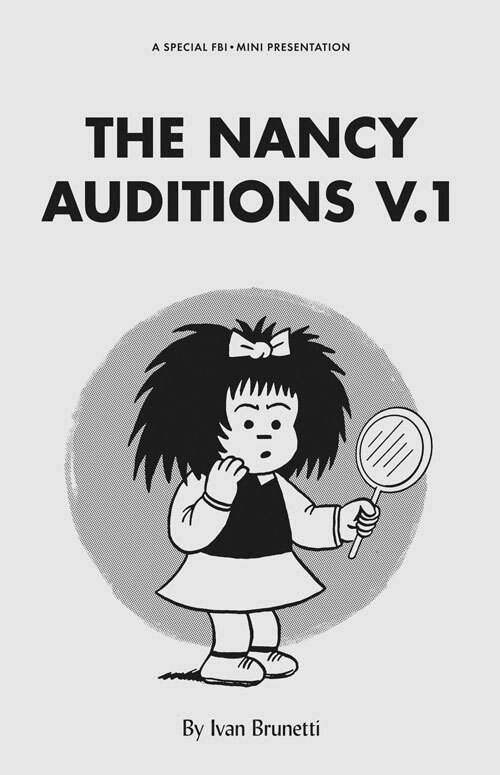 above: some of the Brunetti Nancy strips found their way to print with a Fantagraphics mini-cimic. Hogan’s Alley #13 (2005) ran an interview with Bud Blake, the creator of the Tiger comic strip. The interview took place in mid 2004 and by that time Bud has retired from the daily deadlines. A foot note to the feature said John Wood and Eric Reaves had been hired to continue the Tiger comic strip. For whatever reason that never happened and Tiger has been in rerun status since March 2004. But a few of Eric Reaves Tiger strips have surfaced. A few more can be seen at Eric’s cartoon art gallery page. Brunetti would have been perfect, though I wonder if doing it for years might have driven him mad. Mad, I say. I must mention, though, that when the Gilchrists started off, they looked pretty good. After the apathetic job Jerry Scott did, it seemed like Nancy was back. It didn’t last, unfortunately, and Nancy lost her edge completely and turned into Hallmark-grade shmaltz with a numbing fetishizing of someone else’s observation about “three rocks,” with a side order of blubbering over dead pop stars. But nobody knew that when the syndicate made its decision. Tiger was one of my go-to examples of an excellent strip that never got its due. Blake had a wonderful loopy inkline (reminded me of Ketcham’s) that got looser and more abstract the older he got, to the point that some of his strips were post-modern masterpieces. It was one of the strips that really caught my eye when I was a kid. A Nancy by Brunetti would have been good. Agreed with Brian about “Tiger”. My local paper ran the strip on Sundays, so I got to appreciate its look. Bud Blake was one of the cartooning greats, and I wish he received more appreciation. Bud’s Blake’s blacks were inspiring, masterful; they are the backbone of his layouts. 27 queries in 0.185 seconds.